The email containing your invoice also contains a link to update your billing information. 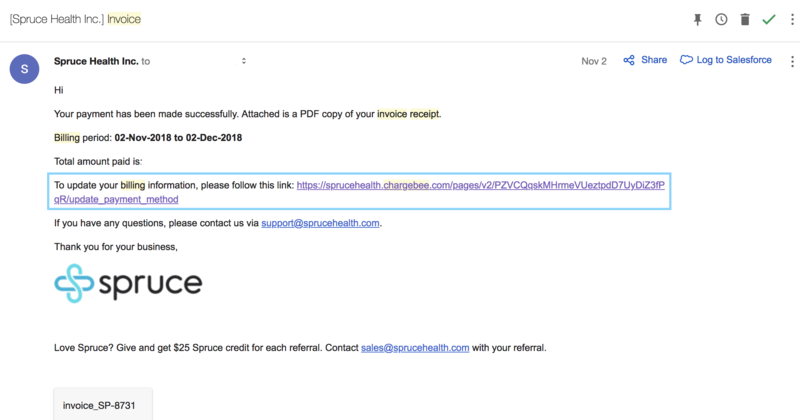 To update your information, open the latest email you have received from support@sprucehealth.com containing the invoice relating to your Spruce subscription. That email contains a link that you can click to update your billing information (see example below). Trying searching "Spruce Health Inc" in your email history. What happens if I can't find the link or email? If you can't find your latest invoice email, or if your latest invoice email does not contain the relevant 'Update Billing Information' link, please email support@sprucehealth.com and we'd be happy to assist you. What happens after I have updated my billing information? Once you have updated your billing information, your new credit card and/or billing address should be reflected in your next billing cycle.